My yard is a garden of Life. At various times, rattlesnakes, our resident garter snake, a King snake, the Rock Wren, the thistles, grasses, a plant that I don’t know the name of that next year will have a spear covered with seeds they sell at the Farmer’s Market as medicinal herbs, the lizards, a rabbit, a rock squirrel, lots of moths and butterflies, ants, bees, hornets, me, my dog, my solar oven and my solar electricity panels, and the climate. And more and more. Most of these things would be very healthy without human interference in their cycles of Life. Looks like our snake is in process of shedding. 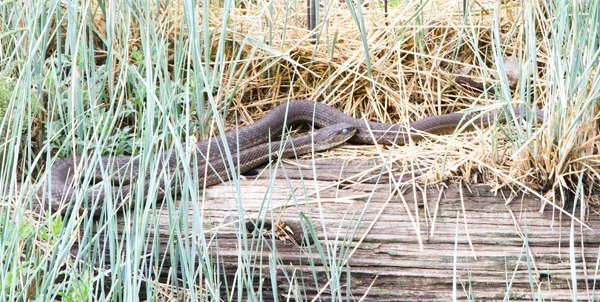 She has been basking all day, which is not her usual pattern, and her eye is glazed over. This morning the climate is based on a thin veil of filmy clouds between us and the source of energy to drive all of this Life. My camera and my nose are buried in the purple thistle blossoms, which in the early morning is one of the sweetest perfumes made by man or nature (and not chemically harmful). My question for this morning is: “How many Life cycles depend upon and/or benefit by this wonderful thistle?” Or maybe it’s not such a good question, as clearly I will never be able to learn the answer. And of course the thistle is only a small part of my garden of Life. 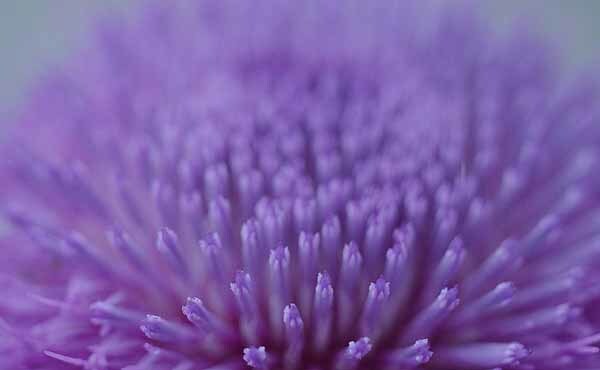 First the thistle benefits itself by making seeds that can float out over the earth, plant themselves, and bring their legacy into the future of Life. It also benefits from all these various insects that feed on its nectar and pollinate its eggs so they can grow into those seeds on a time frame that cycles according to the genetic programming of the plant interacting with the climate and weather of the ecosystem. But then – looking closer – there is a garden growing on the stem of the thistle, nurtured by a tribe of ants. A garden of aphids that live on the “climate” of the thistle stems, drawing food energy from the plant and producing a sweet substance savored by the ants and also a great many other insects, including the fly shown here holding a glob of the sweet stuff. 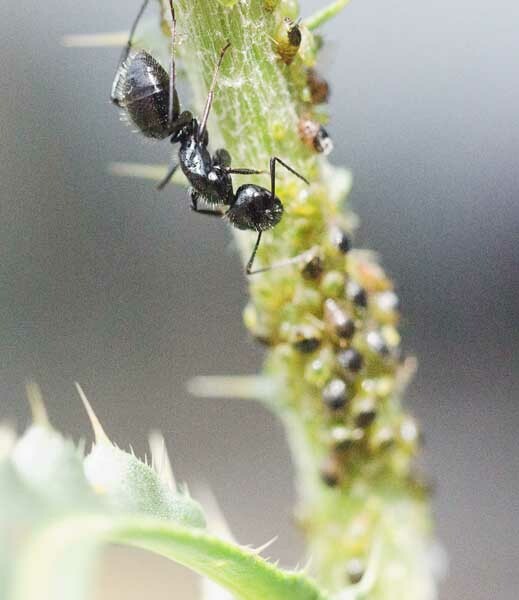 Check it out, the ants nurture the aphids, rather like we nurture cows for their milk. And the aphids feed a multitude. So my thistle is growing in the garden, and on the thistle is another garden of aphids that is nurtured by the ants. And inside the aphids? 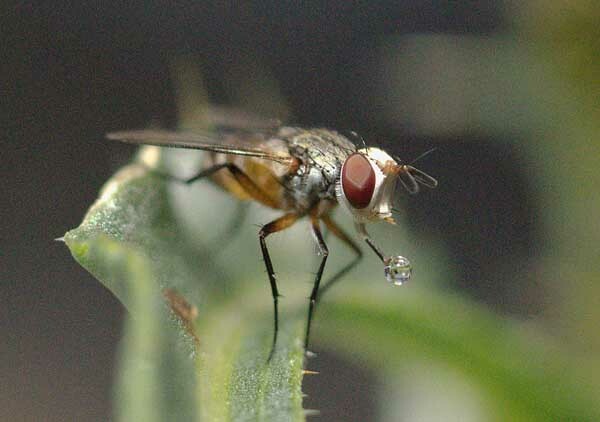 Yes indeed, gardens of micro-organisms are nurtured by the climate that the aphid body provides for their needs, providing the biochemical cycles that produce the sweets. It’s rather like we are growing inside the Biosystem. And the whole shebang is only a tiny part of the biological system that is supported by the climate. And all this together produces the sweet substance of Life. Without which there is no us. That’s how nature stays alive, with gardens of life within other gardens of life, and that is how we must learn to think if we want to survive as part of Life on earth.